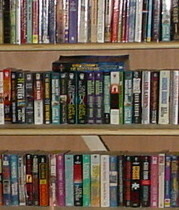 2006 – I will try to expand the pages of photos. I took hundreds of photos. I thought seriously about adding several pages to the book. But black and white did not do justice to the subtle colors of the desert. After all, how would any of us from the cold climbs of Minnesota dream about exactly how many colors there could possibly be to sand? And it is not the lovely red sand/dust of Southwestern Australia, this is normal sand (grin) colored sand. Gritty, not powder, but works it way into everything. 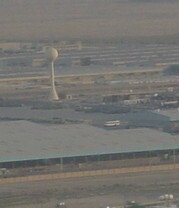 Camp Doha from the air on one of the clearest and least dusty days. Yes, there was almost always this much sand, haze and particles suspended in the air. Promotion to Staff Sergeant for one excellent Non-Commissioned Officer. 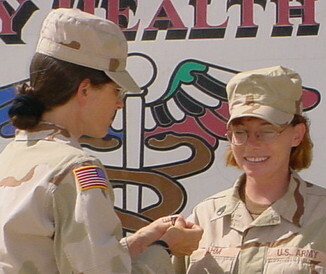 We served together before, including a deployment to Bosnia at the Blue Factory. Nothing like getting called up after leaving active duty, getting sent to Kuwait to do Post Deployment Health Assessments and finding you are right back working for your old Colonel. The army can be a very small world. In the area of the Kuwait/Iraq Border: from the air on both sides of the border, the land is stark and intimidating. The wind has scoured down to bedrock exposing the earth’s bones. 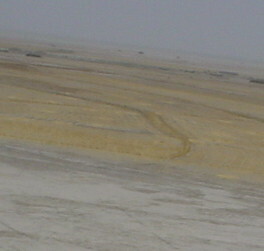 Taken from the air en route back to Udari. Almost everything that arrives in Kuwait rolls north from the Theater Distribution Center by Truck Convoy. It is one of the hardest and most thankless jobs. 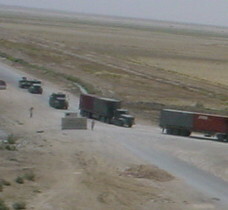 Almost all of the Transportation Assets are now in the Army Reserves and National Guard. They can easily be on the road six and a half days a week. 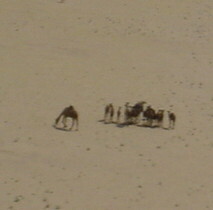 In Southern Iraq, the camels really do not like helicopters. For that matter, I really don’t think that they have a high opinion of people either.